Claudia Williams has completed many private commissions and enjoys working with her clients to create a piece of art that will last many lifetimes. 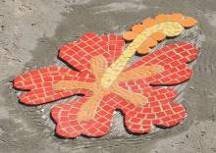 Mosaics are the perfect art medium to decorate floors, walls and ceilings. 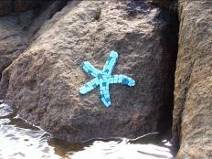 They are amazingly adaptable and can also be included in wet areas and outdoors. Claudia can prepare any design the client desires, from contemporary designs to exact replicas of ancient mosaics from Ravenna or Greece. Below are a few of Claudia’s private commissions. First Consultation: Claudia will discuss placement, materials, and design with the client. The cost of this consultation (longer for some clients than for others) is reflected in the non-refundable Design Fee and final Project Price. Design Authorization and Design Fee: If after the First Consultation the client wants us to prepare a design, the client will authorise Claudia in writing. She will then design and prepare a proposal for the project based on the First Consultation, including a description of the proposed materials, and a proposed Project Price. The Design Fee will range from $150 to $600. We will determine the Design Fee after the First Consultation based on our discussion concerning the project proposal. The Design Fee will be paid in full by cash or check before we will begin any work beyond the First Consultation. All Design Fees will be applied to and credited against the final cost of an installed project. Second Consultation: Claudia will present the proposal. She will discuss the client’s response to it and will address the client’s wishes for modifications to the proposal, if any. Claudia will discuss materials costs, installation cost projections, a project timeline, and the Project Price. If the client wishes that she modify the design proposal after the Second Consultation, the client will issue written authorisation to incur additional Design Fees billable at $100 per hour. Deposit: After Claudia obtains the client’s written approval of and authorisation for commencement of work on the project with an agreed proposal and design, and per these Terms and Conditions, the client will pay (1) any unpaid Design Fees arising from the Second Consultation; (2) a non-refundable deposit equivalent to 50% of the projected installation cost component of the Project Price, and 100% of the projected materials cost. We never advance materials costs on behalf of any client. Materials: All materials once paid for by the client will be delivered to Claudia Williams Studio at the above address. Only those materials used in the project and installed on the client’s property become the property of the client. Claudia typically orders approximately 10% more materials than she believes the final work will require. This margin provides for waste and the subjectivity she requires to complete her projects. If the client terminates the project in writing before commencement of any work, Claudia will return all such materials to client. Final Payment: The remaining balance due shall be payable immediately upon completion and installation of the project, and shall accrue interest at the rate of 1.5% monthly until paid commencing on the next day following Claudia Williams issuance of Notice of Completion to the client, together with a final billing. For smaller projects that will be shipped, payment must be received before shipping. 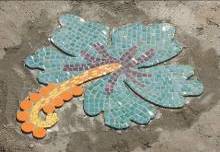 Note: shipping and packaging costs are not included in the price of the mosaic and will be billed separately. 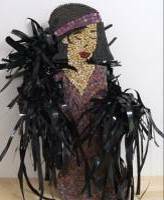 Installation: Claudia Williams can install handmade ceramic and commercial ceramic tile, tesserae and smalti glass tile. 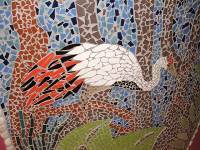 Mosaic-ready walls are the responsibility of the client and suitability will be determined in the sole judgment of Claudia Williams during her consultations. Installation for some jobs may, in the sole judgment of Claudia Williams, require a professional mason. In this event, third party installation costs shall be the sole responsibility of and billed directly to the client. Copyright and Intellectual Property: Claudia Williams always retains all copyrights to all designs, works, drawings, and the like, or any copies or reproductions thereof. Payment in full shall constitute a grant by Claudia Williams to the client of a non-exclusive license to any copyright concerning the project. All drawings, renderings, images or the like, or copies thereof, that are prepared for the client by Claudia Williams, are and shall always remain, without regard to possession, the exclusive property of Claudia Williams. All such drawings, renderings, images, or the like shall be returned to Claudia Williams before commencement of the installation. Such return of said works shall constitute a material representation by the client that it has no such work in its possession, and that client has not permitted any digital, electronic or other copy of such work to be made or distributed, nor has made any themselves, and shall further constitute a material inducement by client for Claudia Williams to commence installation. Client hereby agrees that the agreed liquidated damage for any proven violation of this provision shall be equal to the Project Price. Warranty: Claudia Williams warrants the workmanship and installation of the project except in the event of external damage to the installation or surface to which the installation is attached. 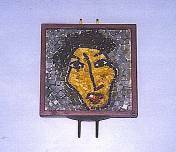 “Audrey” Cinca ceramic & vitreous glass tesserae.